Click here for my story on this on All Things Considered, on National Public Radio. He designed the Centre Pompidou in Paris (above) with Renzo Piano. Renzo Piano won the Pritzker in 1998. Then came the Pompidou Center with accessibility to all, including Paris’ immigrant populations. 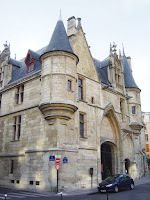 The openness and the open spaces inside – that was highly un-French, especially at the time. Its spaces flowed one into the other, its walls were movable, the exhibitions inside inclusive and dynamic . I always thought “Beaubourg” fit well in Paris. It wasn’t much taller than its surroundings, since it is partially in excavated ground; and I think its reds , yellows, blues and greens pick up the colors of the stained glass windows of the great gothic churches nearby. Pompidou’s exposed structure is not so odd, it reminds me of the flying buttresses atop Notre Dame. A friend and I would tie a little scarf to one of the many pipes outside “Beaubourg” before we went in, so when the one passed by he’d know the other was there. Now that’s a friendly building and city. The place instantly became a hit and its services and systems were overtaxed. It has since been modernized, funny term for a modern monument. In front of “Beaubourg,” the piazza, where it’s space starts sucking you in, was always alive – with fire-breathers from the provinces and strongmen who put chains across their chests and broke them by puffing out their abs as much as they could, and many Bob Dylan wanna-be musicians from Australia, America and other parts. That beautifully conceived public square stayed alive with people into the early morning. I’ll never forget hearing a young woman recite Eluard’s “Ecstasy” at 2 in the morning. She became a friend. Add to this the great Pontus Hulten exhibitions in the early years of the Pompidou, “Paris-Berlin,” “Paris-Moscow,” “Paris-New York,” and “Paris-Paris;” and the fine fountain by Niki de Saint-Phalle and Jean Tinguely nearby. It was rich, communal city life as I had never experienced, but had always craved. Pompidou and all it stood for helped solidify (another funny term, for a building of “almost nothing…”) helped solidify my lifelong interest in architecture. Renzo Piano and Richard Rogers were heroes. 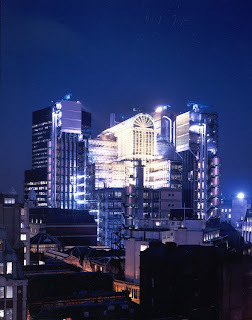 (Below) Lloyd’s of London, Richard Rogers designed not with Renzo Piano, but with his own firm. Early in his career, Richard Rogers worked with Norman Foster. Norman Foster won the Pritzker in 1999. Now Richard Rogers has his. The links are to my NPR stories on each. 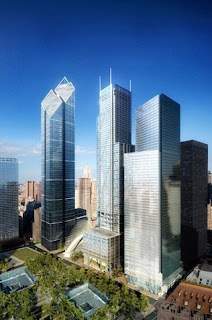 Foster and Rogers have each designed a tower for the World Trade Center site. The old friend’s towers even relate to each other, with the diamond shape. Foster on the left, diamonds on top. (Shall we call that tower “Lucy,” as in “Lucy in the sky, with diamonds”? ) Richard Rogers’ tower is in the middle, with diamond bracing going up the sides. The tower on the right would be by Fumihiko Maki. Maki received a Pritzker in 1993. Here’s a link to today’s press release on Richard Rogers. You are currently browsing the archives for the Richard Rogers category.